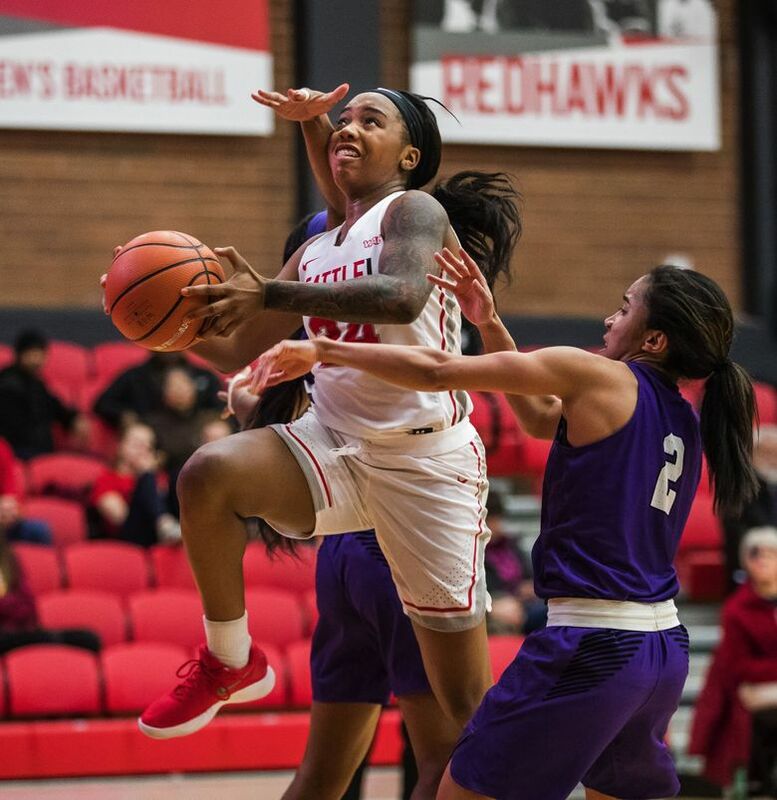 In her senior year, Seattle U wing Alexis Montgomery has put together her finest season in a Redhawks uniform, and she's done it despite a heavy heart. Alexis Montgomery leads the Western Athletic Conference in scoring and rebounding, making her final basketball season at Seattle U her best one yet. Earlier this month, against Missouri, Alexis Montgomery became the first women’s basketball player in Seattle U’s Division I history to record a triple-double. That feat led to her fifth WAC Player of the Week honor, and the WAC preseason player of the year now leads the Redhawks (14-14 overall, 8-5 WAC) into their final regular season game against Utah Valley on Saturday. But the best season of Alexis Montgomery’s basketball career also started out as the toughest. On Oct. 18, Montgomery lost her mother, Pamela Montgomery, to breast cancer after a 17-year battle against the disease. Her passing was not a surprise, Alexis said, but its finality left the family reeling anyway. Amidst her grief, Alexis has somehow found a way to push on in the classroom and on the basketball court. She is averaging 19.6 points and 10.1 rebounds, and she will graduate from Seattle U in June with a degree in communication and media. In the weeks leading up to her mother’s death, Pamela’s health rapidly deteriorated, and Alexis commuted between Seattle and her hometown of Beaverton, Ore., trying to spend as much time with her sick mother as she could, while also juggling school and the Redhawks’ looming basketball season. Alexis was by her mother’s side the day she died. That night, with her older brother and younger sister in tow for moral support, she drove back to Seattle to participate in Midnight Madness with her basketball team. The Redhawks’ coaches had said she could take the time she needed to grieve, but Alexis felt a strong need to be with her teammates, and she knew her mother “wouldn’t have wanted me to sit around and not do anything,” she said. “It was just nice to be with the team,” Alexis said. For Alexis, basketball has always been synonymous with family. Her father, Fred, helped instill that love for basketball in her. Fred used to take the family to Portland Trail Blazers games, and he’s always been fond of hopping into pick-up basketball games around local churches in Beaverton. Fred taught Alexis to dribble at 2, and pretty soon she was shooting expertly at the basketball hoop installed in the driveway of the family home. That driveway hoop got lots of action from the Montgomerys’ family pickup games – Alexis would team up with her father against her 6-foot-3 brother and their mother, as her little sister, Ashlee watched. They were a tight-knit family, and Alexis’ childhood was full of skiing trips, fishing, camping, bowling nights and movie nights. Fred and Pamela divorced right before Alexis left home for college in 2013, but they stayed very involved in their kids’ lives. 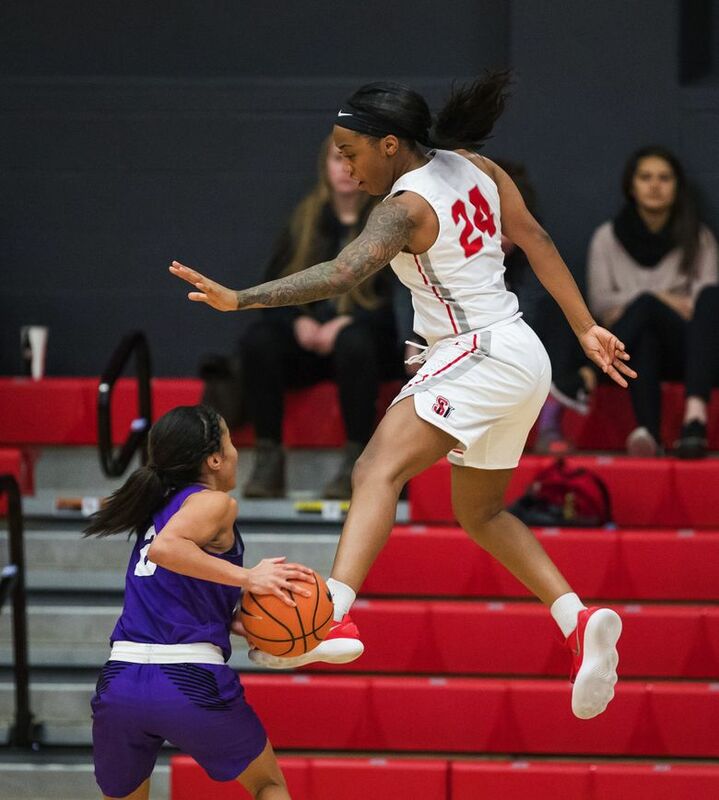 Alexis had numerous basketball scholarship offers out of high school, and she originally committed to play at Louisville before opting to stay closer to home due, in part, to her parents’ divorce. Over the last few years, Pamela and Fred traveled to every one of Alexis’ Seattle U home games … until this season. Fred and Alexis’ siblings still cheered faithfully for Alexis at every Redhawks home game this year. But her mother’s absence was tough to deal with, Alexis said. “I just know personally that I’m playing for her,” Alexis said. 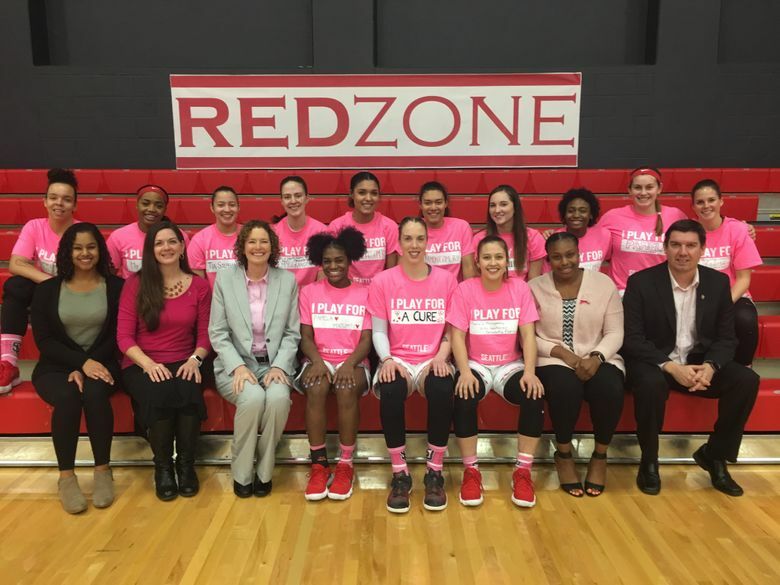 This was especially evident on Feb. 10, when Alexis and her teammates all took the court for warm-ups against Chicago State wearing customized pink T-shirts with “I play for ____” on the front. 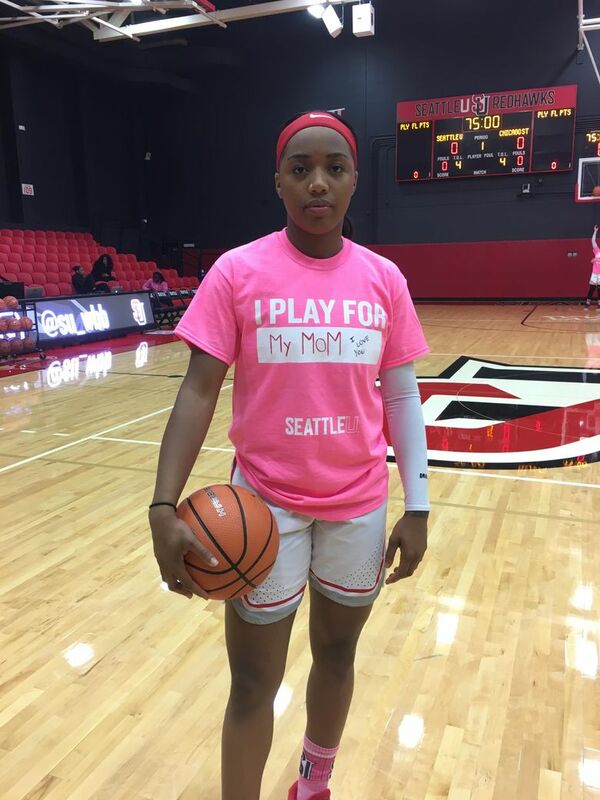 The shirts commemorated Seattle U’s annual Play4Kay game to raise awareness for breast cancer, and in a fitting tribute to Alexis’ mother, most of her teammates showed up with “Pamela Montgomery” written on the front of their pink T-shirts. On Alexis’ shirt, she wrote “My Mom” in red Sharpie, with “I love you” tacked on in smaller letters next to it. She led the Redhawks with 13 rebounds that night even though she played with a heavy heart. As expected, some days have been tougher than others since Alexis lost her mom. But the one constant has been basketball, which has often served as a welcome distraction. Alexis is playing for Pamela this season, and that little bit of extra motivation has showed in her play. Barcomb said Alexis has raised her game in her final year, and has improved significantly in how she distributes the basketball. “I think she’s become a much better passer, and I think she has a greater willingness to share the ball rather than shouldering the burden of scoring,” Barcomb said. She credits the senior for staying the course and maintaining her focus despite grieving for her mother. Barcomb has high expectations of her starting wing, and she hasn’t let up this season. “For me (the hard thing was finding that ground where I was trying to be respectful of her grief, but still trying to coach her hard,” Barcomb said. “Sometimes I wobbled, but I also knew I couldn’t push very hard at times. So it was a very delicate balance.